If hip-hop is supposed to be a voice of the urban masses bringing awareness to the injustices of everyday life, too many albums are released devoid of political messages. 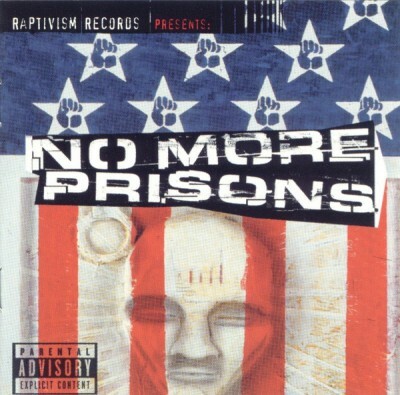 With that sentiment in mind, Raptivism Records’ 1999 release No More Prisons is a gorgeous answer to a full-blown crisis. Uniting underground MCs from coast to coast, No More Prisons comes complete with 23 tracks of personal insight, reflection, and socio-political commentary on the national prison system and the hypocritical foundation those prisons stand on. If the cause wasn’t enough motive to hear this album out, the hip-hop it offers certainly is. Apani B-Fly Emcee, El Battalion, Rubberoom, Lyric, Dead Prez, and so many more bring their styles to the table to create an impressive joint from start to finish. There truly is a little bit of everything here. From Apani B-Fly Emcee and L.I.F.E.’s down-tempo tirade on the circular trap of getting caught in the system (“Outa Site”), to the aggressive jump-up beats on “Where Ya At” (B.K.N.Y. ), to the spoken word musings of Lyric on “Let Us Go,” the common thread is in the issue these tracks illuminate. There are too many shining stars on this joint to even begin to mention them all. DJ Shame, Hedrush, Steele, Kriminal Krash, and still more throw down beats to round out the entire affair. Rarely does an album come complete with an actual message, conscious content, above-the-board production values, and mad skills behind the mic. When all of those elements are seamlessly blended into a complete expression of unity, watch out. The bar’s been raised. 1 comment "VA – No More Prisons (CD) (1999) (FLAC + 320 kbps)"